« How to download youtube videos without software? How to fix ‘ioctl(SIOCSIWMODE) failed: Device or resource busy ‘ problem. 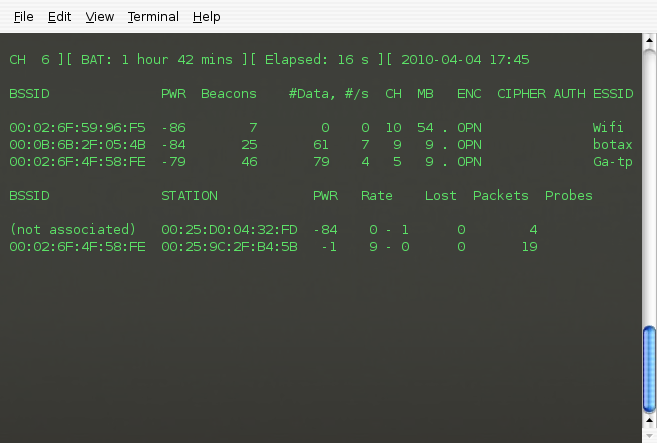 Airodump-ng is one of favorite tools in hacking wireless network. When I upgrade my ubuntu from Gutsy to Intrepid, I can’t run this application anymore. It’s not application error because I can run it in Gutsy version before. My wireless card chip set is ‘ipw3945’. The error message is a bit complicated as you see below. Mean that if you want your airodump-ng run, you will need to try to fix the bolds problems above. Your problem may be one of it but in my case not even one of the error message. Try to figure out the answer quite some times which is actually is very simple. It’s only change the ipw3945 chip set mode from ‘Managed‘ to ‘monitor‘. 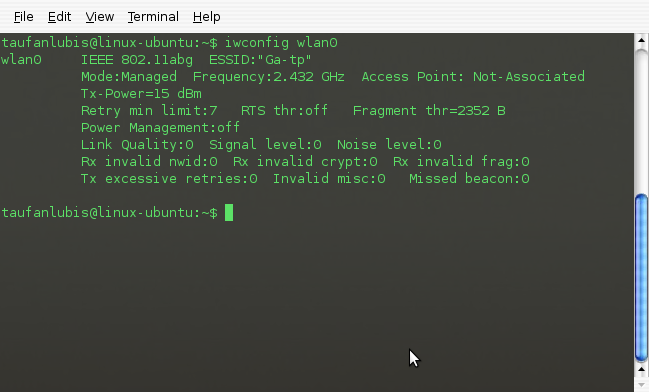 From the Terminal Screen, type ‘iwconfig wlan0‘. Your wireless card name (wlan0) may be different. It will depend on your wireless card chip set or your Ubuntu version. When I used Gutsy or lower version, my wireless card (ipw3945) is ‘eth1’ but when I upgrade to ‘Intrepid’, it become ‘wlan0’. 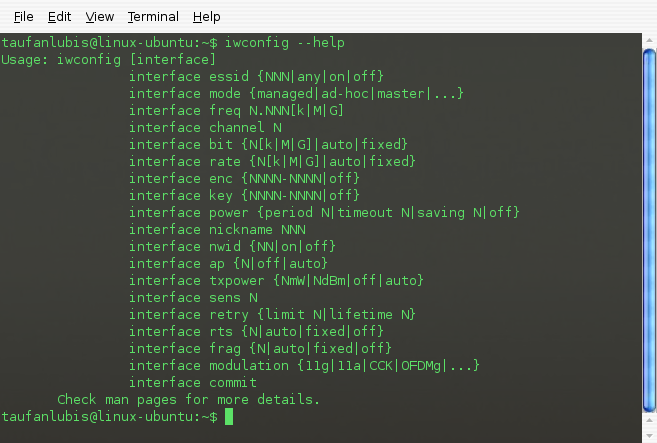 If you don’t remember the iwconfig command line, just type ‘iwconfig –help‘. What we need now is the information in ‘interface mode’. We have to change the ‘mode’ from ‘Managed‘ to ‘monitor‘. Step 2. Change the wireless card mode. First turn of your wireless card. Type ‘sudo ifconfig wlan0 down‘. Second, change your wireless card mode from ‘Managed’ to monitor. 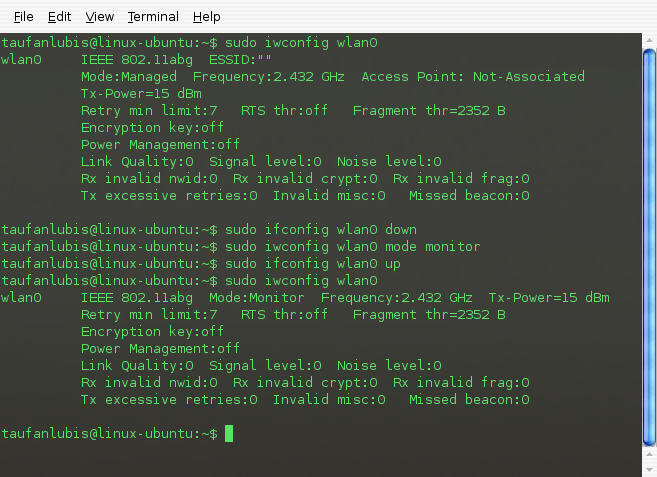 Type ‘sudo iwconfig wlan0 mode monitor‘. Third, turn on again your wireless card. Type ‘sudo ifconfig wlan0 up‘. Fourth, check the wireless card status. Type ‘sudo iwconfig wlan0‘. Now, my wireless card mode is ‘monitor‘ and you are ready to run ‘airdump-ng’ application again. Thx for you post. It was very useful. However, I’m using a ASUS WL-167g v2 and when i’m monitoring it finds only networks using WAP. Is it normal or maybe it came with a configuration created only to find this encryptions? Thanks for the post really helpful for me. Thanks a lot. That’s really helped me. Thanks dude this really Helped me alot. hey it still gives an error for me. You are great ! 🙂 Thx a lot! Thanks! Worked perfectly on my Lucid Lynx (Acer Aspire laptop) box. Everytime I type your commands ! note to newbies: this kicks you off all wifi. so if you are training online, you might want to copy the respective steps of your training. I’ve searched for hours and tried everything I know and… nothing. The only problem I had was after getting it to work in monitor mode I couldn’t get it to work back in “managed” mode. It would connect and seem to be working but I couldn’t hit my gateway. I simply reversed operation but required a reboot to get back on the internet to find a solution….still looking. 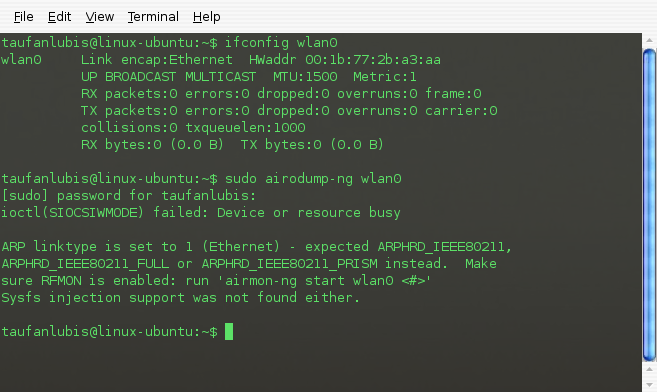 hi, this a very usefull trick, thanks for that, anyway, i’m still having this issue with airodump, it doesn’t show any signal, i mean “nothing” they told me that i should use “sudo airmon-ng check kill” but the thing still happening. just a note, i have to switch back to managed mode if i want to actually connect to a network. thannx a lot for post. It is so useful. and after that i did kill all of these processes with “kill -9 PID”, but it restarts these processes again…… any solution?? hi thank for the post after putting it in monitor mode like shown above i still can see any interfaces plz can u help me????????????? Thanks, great post. Also useful for backtrack users. on August 15, 2015 at 10:37 pm | Reply Dragon Fly Jones! thank you, may another good friend do the same. ‘sudo iwconfig wlan0 mode monitor‘. –> SET failed on device wds0 ; Operation not supported. What is mean, not supporteed? ?